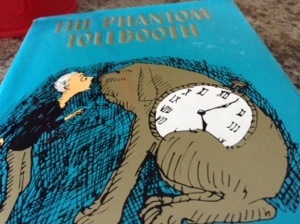 If you have never read The Phantom Tollbooth by Norm Juster, it’s really time to take an hour or two and wallow. My kids loved the book, read it over and over, and I can see why – the endless plays on words are fantastically imaginative and I personally want a watchdog, a much more pleasant creature than the White Rabbit, tho similarly obsessed with time. I adore the characters, from KING AZAZ THE UNABRIDGED to Faintly Macabre, , the not-so-wicked which. From 9-9:30 we take our early mid morning nap. From 10:30 to 11:30 we take our late mid morning nap. The Doldrums are inhabited by the Lethargians. Which is kind of how I’m feeling these days… Like them I want to take a holiday and go nowhere, rest up from doing nothing. And that’s why I need Tock, the Watchdog, who keeps people from wasting time…apparently you can only get out of the doldrums by thinking. It’s a glorious fall day. I think I’ll take myself for a walk, and then, in honour of Alice Munro’s Nobel prize win, I shall curl up with one of her books and seek inspiration.